The Wind Ensemble will be playing selections from its upcoming tour to Ohio, New York, and Massachusetts. The ensemble will be playing at a number of high schools and churches along the way. Pieces on the program include: “Aegean Festival Overture,” by Andreas Makris; “Paris Sketches,” by Martin Ellerby; “Shakata,” by Thomas Wilson; and “Rolling Thunder,” by Henry Fillmore. The Hope College Wind Ensemble is the premier wind group on the Hope campus, and performs a wide variety of music, from standard works, to cutting-edge, 20th-century works, to chamber pieces. 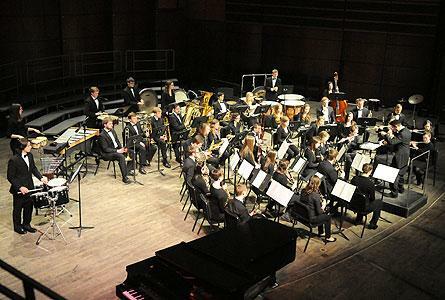 The Wind Ensemble performs several concerts each semester both on-campus and off-campus, including a Halloween concert and during Musical Showcase at DeVos Hall in Grand Rapids. The Wind Ensemble is directed by Gabe Southard, associate professor of music and director of bands.